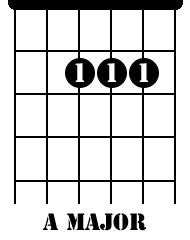 With the D-A-Bm-G guitar chord progression, we cover the first group of four chords in our series. I'll also cover the Bm-G-D-A progression here. If you look real quick, all we've done is swapped the first two chords with the last two. The Bm chord really has the power to change the mood of a song, giving a bit of a somber sound to the progression. It depends on the beat of the song as well as how long the chord is played in the progression. 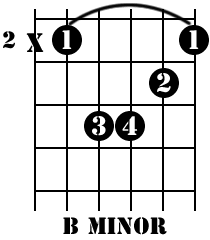 First the D-A-Bm-G chord progression. I've got a couple examples of songs using this progression. The first is "Girlfriend" by Avril Lavigne. This is an upbeat bubblegum punk tune that uses the progression throughout the song, in both the verses and chorus. The song has a fast tempo that you can't help but jump around when you're playing it. Here's a great selection of tabs for "Girlfriend" by Avril Lavigne. Contrast that with the melancholy "When We Die" by Bowling For Soup. Again, the progression is used for both the verse and chorus of the song. While you won't be running around the stage during this number, it still has some powerful sections where the power chords stand out. To learn the guitar chord progression, you can get the tabs for "When We Die" by Bowling For Soup right here. Switching it up just a bit, we're going to swap the chords around , moving the first two chords D and A to the back of the progression. So now you have Bm-G-D-A as your line-up. The Bm-G-D-A progression is used for the chorus in this song. Learn to play "Perfect World" by Simple Plan with these tabs. The Bm-G-D-A is also used in the chorus of this song, "It's My Life" by Bon Jovi. There are a ton of tabs to choose from for this tune! 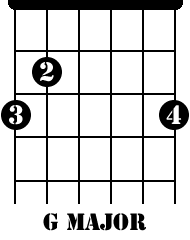 With the next guitar chord progression, we're going to stick with the same four chords. We're just going to switch them around a little bit. 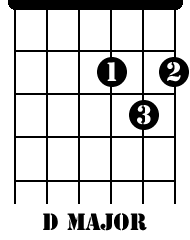 Let's move on to the D-G-Bm-A guitar chord progression.